People infected with Ebola virus were 20 percent more likely to survive if they were co-infected with malaria-causing Plasmodium parasites, according to data collected at an Ebola diagnostic laboratory in Liberia in 2014-15. Moreover, greater numbers of Plasmodium parasites correlated with increased rates of Ebola survival, according to a dozen collaborating research groups in the new study, published in Clinical Infectious Diseases. The survival difference was evident even after controlling for Ebola viral load and age. Scientists from the National Institute of Allergy and Infectious Diseases, part of the National Institutes of Health (NIH), led the project. At a joint diagnostic laboratory established in Liberia by NIH and the Centers for Disease Control and Prevention, the scientists tested 1,868 blood samples. The samples were from people seeking care for possible Ebola virus infection at the ELWA3 Ebola Treatment Unit in Monrovia. 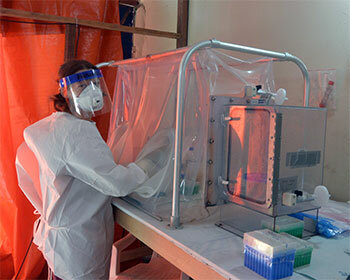 Testing confirmed Ebola virus infection in 1,182 samples; 956 of them were tested for Plasmodium parasites, and 185 were positive. Fifty-eight percent with both infections survived, compared to 46 percent who were infected with Ebola virus alone. Of the people with the highest Plasmodium levels, 83 percent survived. Anti-malaria drugs were routinely administered to all patients seen at the Treatment Unit during the Ebola outbreak and had no bearing on the increased survival in Plasmodium-infected patients in the study, the researchers say. Moreover, in separate experiments conducted in the United States, treatment with antimalarials did not affect survival in laboratory mice infected with Ebola virus. The research group is working to pinpoint a mechanism that could explain the association between Plasmodium infection and surviving an Ebola infection. If a connection is found, they say it might improve understanding of disease caused by Ebola and open possibilities for developing new treatments.